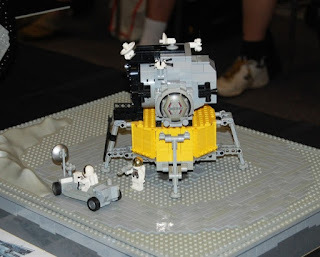 We had a terrific time at Astrofest this year! A big thank you to all those who attended - it was a surprisingly large turnout. People were queuing up to our display! They obviously wanted a good look at the space shuttle, the solar-powered rover, skylab, solar system models and Star Wars spacecraft. Click here to see our photos on Brickshelf. Lastly, we would like to thank Astronomy WA for organising this event, and also thank Curtin University for hosting it.